YourDictionary.com defines death rattle as "a sound that sometimes comes from the throat of a dying person, caused by breath passing through mucus". It is the sound of breathing through secretions in the back of the throat or upper lung airways. This rattling or gurgling sound can be a sign that death is near in a few hours to a few days. What Causes the Death Rattle Sound? A death rattle is common in dying patients, according to a 2014 Journal of Pain and Symptom Management review. The noisy breathing of the rattle is generally thought of as a sign that death is near, often within 48 hours, notes a 2005 review in Neurocritical Care. Breathing patterns will change as death nears and this is typically when the death rattle may occur. The actual sound of the death rattle can vary. It may be a soft moaning or snoring sound, a loud gurgling or rattling noise or a crackling, wet noise. When breathing becomes labored, the death rattle will become amplified when the person breathes in and out. As awful and unpleasant as the death rattle sounds, the person does not experience any pain or discomfort associated with the death rattle. When a person cannot cough or swallow to clear saliva and other fluids in the back of the throat or respiratory airways, breathing in and out vibrates, or rattles, the secretions. The noisy, wet, movement of air might sound like a gurgle or gargle. You may also hear this sound when the throat or air spaces are obstructed or affected for any reason. These dying patients are usually unconscious or at a minimal level of consciousness. The sound of the death rattle doesn't always mean that death is approaching. It can also occur when any other medical conditions interfere with breathing, swallowing, or coughing and clearing of the throat or airways. The affected person generally makes the rattle while under a depressed level of consciousness as mentioned, or while sleeping. A stroke or other brain injury that interferes with brain centers or nerve pathways that control breathing or the ability to swallow or cough. A mucus plug, infection, or blood. Food, vomit, or foreign body. Tumor, airway spasm, or trauma to the throat or lung airways. A chest or abdominal injury that makes it a struggle to breathe or cough and clear secretions. Pain medicines, such as morphine or fentanyl, and sedatives such as benzodiazepines that can decrease consciousness, the ability to swallow, and the cough reflex. Lung or heart problems, such pneumonia and heart failure which cause accumulation of fluids in the lungs (pulmonary edema) and around the heart. Neurologic disorders such as myasthenia gravis that interfere with swallowing or coughing. Treatment of the underlying cause in these circumstances is the first step in alleviating the rattle. In a dying patient, healthcare providers might try to control the rattle to ease their discomfort with the sound, and to relieve the anxieties and fear of the family, rather than for the benefit of the dying. 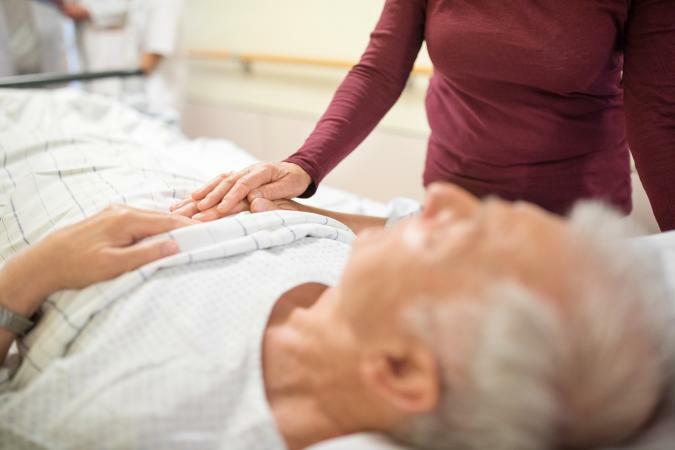 The death rattle noise can be distressing to hear but there is no evidence that a dying person is disturbed by it, according to a 2013 review in the British Journal of Nursing. Placing a patient on his side. Suctioning the mouth and throat; however, this might distress the patient and it only briefly works because the secretions will soon re-accumulate. The use of drugs that dry up secretions, such as scopolamine and atropine. The death rattle is most commonly heard in a dying patient and might signal that death is close. Other health conditions can also cause the rattle which can be distressing to listeners. Understanding the origin of the sound can help to decrease the anxieties and stress of care providers and family.